Playing football in Trevor’s early teen years with home team Meander was his first sport. 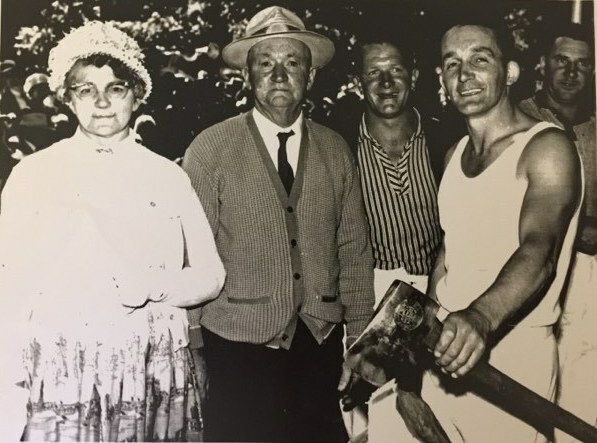 After receiving an axe from his father he commenced woodchopping in 1943 at the age of 17. Trevor combined both sports with great success, until the call of the army came in 1945, not to return until 1947. Trevor seemed to start where he left off once returning to both football and woodchopping, winning his fair share of standing and underhand events. Claiming every 12 inch block on the North West Coast circuit bar one, winning the prestigious Henley Foot in 1950 the same year he was married. Trevor also toured New Zealand with success winning several chops. A shoulder injury from football ended Trevor’s competitive days but in 1968 found him in the starter box where he became known as “The voice of woodchopping”. With the ability to run events, commentate and keep the public well informed of what was happening in the woodchopp arena. Trevor made a point of firstly knowing each competitor so as to pass on this information through his public address. This included visitors from overseas and interstate axemen. Trevor left the starter’s box after the 1970 World Series. Trevor moved his family to Launceston in 1976, where he was lured back into the starters box by the Northern Division in 1986. Once again Trevor began like he had not missed a single season until 1993 when for family reasons he retired this time for good. Trevor remained in contact and his interest in woodchopping was still there until he passes away in 2007. 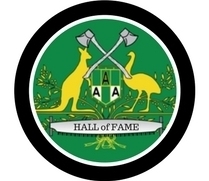 A starter and commentator regarded as one of the very best: The voice of woodchopping.